Escape to the beach in this lower level duplex unit, sitting directly on the sand! 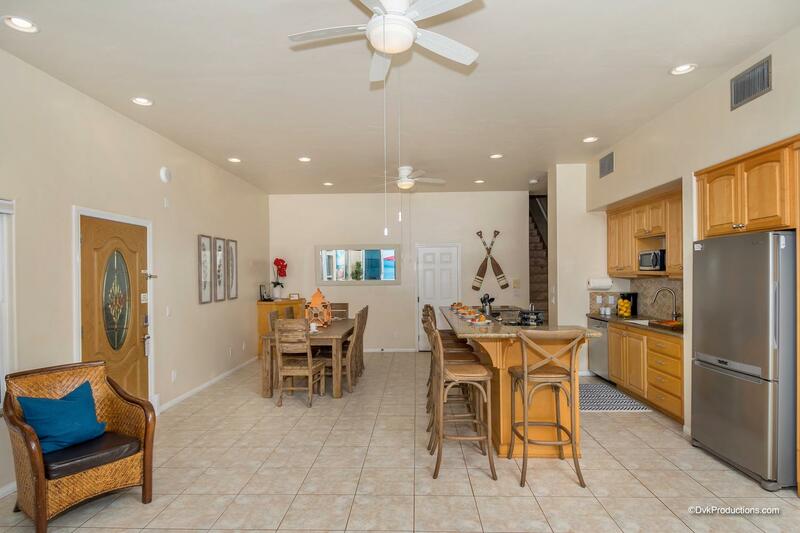 This home has a full kitchen with granite counters, and stainless appliances, a large and open dining/living room area, a fireplace in the master bedroom, and more! There is a private spa on the beachfront patio, just outside your living room glass door. The beach access is right over a ramp and onto the sand (see photo). If extra parking is needed for additional vehicles, we do offer our guests parking at at our office in Oceanside, located at 1640 Oceanside Blvd, Oceanside, CA 92054. This vacation rental is perfect for families with children and couples looking to get away alike. Come escape to luxury on the beach! Location is great! Rental is clean. Amazing sunsets. Very nice to have your own private patio and jacuzzi! The unit was also stocked with everything you need for your stay,so no need to bring anything. Will be booking this rental again! An amazing time for my entire family! Our family reunion/60th birthday was the best ever! One of the kids said "It cant get any better than this"! Another said "This was the best vacation I have ever had"! We swam/surfed during the day and roasted marshmallows for smores at night while watching the waves crash. It was amazing. Dolphins also gave us a wonderful nature show on almost every day. We really got away from the TV and reconnected as a family. We will never forget our beach vacation! Also, the house was very clean and if something needed to be fixed we made a call and within 30 minutes someone was there to fix it- that was fabulous! I cannot express my gratitude in enough words to Beachfront Only staff for making our family reunion/60th birthday something we will always cherish!! Thank you to all the Beachfront Only staff that helped to make this possible! This is the second time we stayed in this condo and both experiences were truly wonderful. The condo was beautiful, comfortable and sparkly clean. The kitchen had a lovely layout. We spent a lot of time in the living room, watching the ocean or on the patio, doing the same. It was so peaceful to fall asleep listening to the sound of the waves. You can see the Oceanside. from the patio and the strand is but a five minute walk away. I’m looking forward to our next visit and highly recommend this condo. Lots of Love from the Adams - BFO is the best! We absolutely loved our beachfront rental so much we had to stay an extra couple of days...The home was so perfect for our needs! We were celebrating 60th wedding anniversary with parents earlier in the week in LA area and the smoke from Malibu fires made us have to relocate. Working with BFO was so pleasant and they were accommodating to every need. The house was a perfect fit for big group and we cooked in the fabulous kitchen and on the BBQ grill (fresh fish from the OS Harbor). Kitchen tools were plenty and fresh towels/linens were good quality. Beach was steps away, great views and big picture window in family room was breathtaking everyday! We are happy to say we will be renting from BFO again and again, always a great experience!! We have stayed at this condo for several years and it is always a wonderful experience. We liked the new decor in the bedrooms. We had to call for a maintenance issue and the young man that came was very kind and professional. We love using Beachfront Only for out yearly girls Oceanside trip and hope to continue for many years to come. We had a delightful time. Lovely to hear the waves 24x7, vivid sunsets, and we watched the ocean for hours. Saw pelicans, dolphins, and a whale. A spacious, well equipped kitchen and four comfortable bedrooms. The master bedroom was especially spectacular. Not far south of the strand, it’s a pleasant walk to the pier. Short drive to Frazier Farms. We’ve already booked another stay! We loved watching the dolphins swim in the ocean as we ate dinner on the patio! Our Beachfront only rental was beautiful. We were right on the water and a family of dolphins stayed by our porch in the surf for days! Everything we needed was provided and clean. Our oven stopped working and the maintainence crew had replaced it with a whole new one within a couple of hours. The tides gave us huge waves for some of the day and low tide good enough to swim and boogie board in for a few hours as well. We had a wonderful vacation with our family and would definitely recommend it. The condo was just as described and big for the whole family (7 adults, 3 kids, 2 dogs). We did have a problem as the hot tub never got hot (we called and maintenance came out filled the tub with hot water) and said it wasn't filled right but the hot tub NEVER got hot - warm, yes but not to be enjoyed unfortunately. All in all a great time was had by all. The unit itself was great and the property overall met expectations. What was disappointing was the lack of beach to enjoy. The small beach backyard is about 12 x 12 and shared among all units. You scale down the rocks and you are knee deep in the ocean and it is really rocky and rough. We had another wonderful stay at the Beachfront condo that we've rented several times now. The view is unbeatable and the accomodations are more than sufficient. We were short some towels when we arrived. We called the contact number and towels were delivered very shortly after that. Two suggestions to add to the luxury of this condo-- a new can opener and some lounge chairs on the patio. Otherwise, what else could anyone ask for?!! After using BeachFront Only for the second time, I really regret previously using VRBO, AirBNB and the like. With BeachFront you get the experience/service of a professional organization with the comfort of a private home. The location is outstanding and the home was perfect for our 4 families and their kids. The kitchen was well-stocked, beds were comfortable, ample towels, washer/dryer in the home, nice appliances, etc. Maybe a gas grill instead of charcoal would be nice. Better ventilation in the kitchen would have been nice as the smoke detector went off while making dinner. But really, I'm grasping for suggestions...we loved it. wonderful property, r needs were well taken care of. would like alittle more sand in front of patio, but see why its low, because of extra high tide. alittle unsettling! The location was absolutely perfect! We had amazing views and loved the hot tub and fire pit! The house was equipped with everything we needed and loves that it had 2 washer and dryers! We had the best time! We had a great time. We stayed for 4 nights and wish we could have stayed longer. We had a daughter graduate and was leaving for college the next week and just wanted a relaxing place to spend time together and relax. The house was nice and big enough for all 8 of us to be comfortable. It was nice to have internet and have cable so my husband could watch the NBA playoffs!! We loved having the doors open and listening to the ocean at night. We saw dolphins everyday and even saw a sea lion. There were alot of rocks in the water but water shoes made it perfect. The waves were nice and big at times and the kids loved boogie boarding. There were people staying above us the whole time and we could hear them walking at times but it wasnt horrible at all. The hot tub was so nice to warm up in after being in the ocean. The parking on the street was easy and we always found a spot right by the rental house to park. There were plenty of towels for everyone and the double washer/dryer was very nice to have. The only thing we found missing was a dust pan and can opener but it had everything else needed to cook and clean up after. We cant wait to go again. We needed a place to stay fast and I called BeachFrontOnly hoping that they could help me. They were so accommodating, providing excellent customer service, and helped me get into this great house! We had a big group and we all fit perfectly. Our kids had a blast on the beach each day and the sunsets were the best we've ever seen. The house was very clean when we arrived, and the other amenities were excellent. It's hard to find trust-worthy rental companies that actually give you the experience your seeking. BeachFrontOnly is the best way to go. They provided a great experience for our family vacation! As always we had a wonderful stay. We love this condo and have been her multiple time. Sitting on the patio and enjoying how close it is the beach. The sights and sounds are amazing. My sisters and our daughters gathered from around the country for a weekend get-away. The weather was very stormy with rain and high winds. Being right at the ocean's edge gave us an upfront look at the huge waves and their sound! We could sit on the sofa in the living room and watch it all! The younger girls had a day in the spa with the waves crashing behind them. We were warm and comfortable inside with the full kitchen, lots of bed space and places to play games. We will do this again! Nice property but the cookware was small sized, cooking utensils inadequate and outside garbages were too small. I was told I would have everything that a regular kitchen had but that was incorrect. This place is an amazing location, it has four total bedrooms with multiple beds in several of the bedrooms. When they say this place is a beachfront, they mean a beachfront. The waves crash against the rocks during high tide, usually in the evening, which makes for a great scenic, sunset. The staff is very attentive, we asked for a minor issue to be fixed during our stay and they had someone come over immediately to ensure a great stay. I cannot speak highly enough about this company and this location, its kid friendly and family friendly. 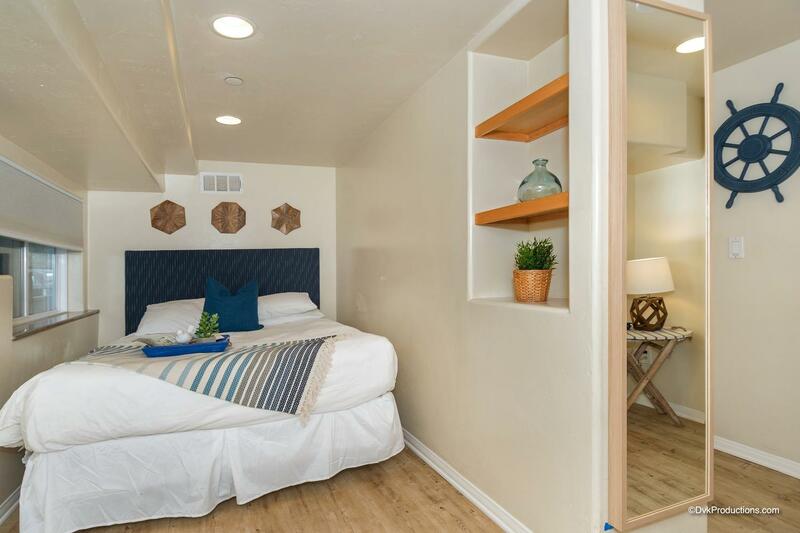 Its located 3 blocks from a decent market that will have anything you could need and under a 15 minute walk the pier to take advantage of great restaurants. What a great experience. I rented this property with my mom and sisters for my sisters 50th birthday. What a great place, right on the ocean. Everything was clean and new. The beds were extremely comfortable. We couldn't have asked for a better place to stay. We are already recommending this place to a few of our friends. We will definitely stay here again when we come back to Oceanside. We had a great five days in this condo and recommend the location! High tide is right at the patio, and low tide gives you tons of sand for playtime. The condo is clean and well-stocked, with plenty of towels, pillows, and blankets for all. I would note that "sleeps 12" really meant beds for 8, and two ottomans that folded out into beds that really fit just one each. A more accurate description would be sleeps 8 and fold-outs for 2 children included, plus two couches? Bed descriptions aside, would stay here again! Stayed here with the extended family. Everyone had a wonderful time and enjoyed the house and location. Highly recommended. We celebrate Chrismas in February since it is too difficult for our family to get together in December. The condo was in great condition and just lovely. Beachfront rentals was very generous with the amount of towels provided and the oceanfront hot tub was a huge success. We are looking forward to our Kerchner Christmas next year in Oceanside. So many rocks by stairs and that is all. AmaIng to watch whales off your back patio listening to the ocean. This was the 3rd year in a row we have rented this unit in January. We keep going back because it is perfect for our family. I rent the unit/units for my grown children and grandchildren as their "Christmas gift". We all prefer this family fun time instead of presents. This year we had my sis and brother-in-law join us from Illinois, a nice break for them from the cold weather. For Californians, January may seem like a strange time for a beach trip, but our kids put on wet suits and spend hours each day in the ocean. The property is perfect and the rental company is very helpful. In past reviews I noted that I would like to see a better equiped kitchen. This visit it was a pleasure to see a new knife set and a stocked spice rack. Oceanside not the greatest city, but house was nice and right on beach and close to pier, amenities. Walk out patio door and step right onto amazing beach is pretty great! Biggest issues were chirping refridgerator that kept us up for a bit at night and no broom to sweep up sand that collected on floor. Fix the fridge and I likely would give full 5 star review. There was a problem with hot tub and mgmt company came out immediately and made sure all was working as should. Turned out that it just hadn't heated up enough by the time we checked in. Our family of 8 had a great stay. There were gray whales and dolphins right in front of our condo. Fantastic!! The only complaint was the availability of hot water for 6 showers every day and the lack of water pressure in the main bath. We were also not able to connect to the inter net. Other than that it was truly fantastic. This home should not encourage dogs! There's no place for a dog to go but inside. There is a small sliver of walkway beyond the front masonry where we took the dogs to do their business (and we picked up after) The owner of the property to the north is a raving lunatic who lied about losing tenants, we spoke to the tenants that left and the next tenants that followed, both came and went as scheduled. There is a narrow unfenced strip of sand between the two homes, but seeing the dogs being walked through there led to the lunatic's ravings. Obviously the city knows of her ravings because they didn't bother to show up to her complaint. Anyway, your inviting dogs here is a losing proposition that can't make anyone happy. Maybe you could reconsider if the lunatic sells it, but under the best of circumstances there's maybe 30 sq feet a dog can use for anything outdoorsy. It's a lose-lose situation, the property and the beach are NOT for dogs of any size, not even our yorkies we allowed to be yorkies. We had 20 people in the 3 story condo next to us but the children were well behave. The people on the other side came over and asked to use hot tub which we denied. Otherwise it was enjoyable, clean and relaxing. Everything was great except the master bedroom did not have a bath. To use the bath you had to go through the family room to the kitchen and around the corner to a small bathroom. Also almost no closet space and few drawers. This condo was perfect. We enjoyed every second of our stay. Thank you Beachfront! I would definitely rent this home again and I would most certainly refer friends and family to your company! Nice, but not for people with a sensitivity to mold. Location was superb but my wife has a severe allergy to mold. When we arrived the unit had been closed up and dark and it reeked of must and mold. She could not stay in the condo for more than an hour before serious coughing attacks and still is trying to recover from the congestion that developed in her lungs. We were forced to stay at a nearby hotel, even though we paid a lot of money to stay there. Rest of the party were OK and enjoyed themselves. Also, problem getting hot water to the top bathroom…this was resolved once but it really takes long time. Loved the location on the beach. The location was amazing. Bedding and linens need updating. We liked tha we didn't need to stop and get keys to the unit. Once the upstairs was rented the noise crime the tile unit could be headed through the adjoining door. So this is how it feels to live like the rich! Beautiful property right on the sand; very private beach. My only complaint is...I wished I had stayed longer! This rental more than exceeded our expectations!! The location was perfect- easy to find, plenty of parking, clean, spacious and perfectly set up so the kids could play on the beach and we could watch them from the house. We could see dolphins playing in the water from our deck and the weather was heaven. The kitchen is well stocked with tools and appliances. The beds were comfortbale and clean bath and beach towels were provided. The only downside was that on our last morning the upstairs neighbors allowed their children to run all over the house at 6:30AM. After knocking on their door for 10 minutes they reluctantly told us they would "try" and keep them from running. At that point one of our children had already been woken up. However- that is not the fault of the rental property- it's the lack of consideration of our nighbors. I would HIGHLY recommend this rental to anyone looking to relax on the beach with their family. We rented this property for a much needed family getaway. It was perfect. I loved that the bedrooms are mostly on one end of the property enabling us to put our kids to bed and still stay up watching movies and listening to the waves crashing. The property was very clean and provided all of the necessaries needed for a week of vacation. My family had a great time. The house was roomy, clean and stocked with everything we needed minus food. The only downside was the current storm brought the tide in so far , there was no beach. Besides that, it was wonderful. We have stayed at this property 3 years in a row now and love the location. This year however the home was run down a bit. The screen door facing the beach didn't work which allowed bugs to enter the was annoying. There was no broom at the property so that left us walking on sand the entire week. There were no dryer sheets so we had to go buy our own. The cabinet under the sink was not attached as the hinges were rusted out and not attached. We needed a plunger at one point but there was not one at the home. This is a great beach front property, it just needs a little TLC. I was disappointed to pay so much money and then not have the amenities needed for a normal week long stay. Thanks for your valuable feedback, as it's our aim to serve our customers and provide them with an outstanding beachfront experience. We did fix the screen door and sink hinges on 10/13/14, and have since added a broom for our guest's use. We do not provide dryer sheets or plungers, but do have a maintenance team available to address plumbing issues. We appreciate the information you provided, and look forward to seeing you again! Fun weekend at the Beach,Girls Only! Everything was great about our experience with Beachfront only. House was clean and as described, only wish there was a place to leave beach toys for next guests. Very expensive but worth it. Our third stay at this location was tempered by a bad hot tub. The house, the location, the service was fantastic. The hot tub was out of bromine and had a dirty filter, and by day three was very smelly. We called and a technician was sent out, but by then, all of our children were covered in red bumps. The doctor diagnosed it as hot tub folliculitis. Medical bills and anti-biotics are not the souvenir we had hoped for. So overall, it is a great place. Just make sure the hot tub has been recently serviced. Gorgeous place and setting. The hot tub jets and heater need some maintenance but it was still a beautiful thing. Overall, incredible experience and would go back in a heartbeat. I think it's more about the company i was with, but this venue provided the optimal amount of activities vs independence. Being right on the beach is an understatement...the picture doesn't lie and the view is absolutely breathtaking. The surrounding town isn't great in terms of things to do, but Encinitas and La Jolla aren't too far away. Would highly recommend cooking and taking advantage of the sheer beauty. *The TV--in the living room is way too small given the size of the room and how far back the couches are. The TV in the master bedroom needs more channels. *The ice cube trays--new ones or a working ice machine. Overall, these are small nit-picky items when in the grand scheme of things wasn't cause for too much concern. Again, i would recommend this place to a family or a group of friends. Go and create yourself some lasting memories. Excellent experience. A couple of minor needs at the rental but they were quickly responded to and corrected. Only complaint. Would like to check in earlier but absolutely need a later check out. Will definitely recommend this rental as long as current condition is maintained. (Master bedroom carpet had some stains so may need to be replaced soon). Location was perfect. Jacuzzi cooled down too quickly. Already have had friends inquiring about property to rent it. This is second time we have stayed at this property, perfect location, privacy, quiet. Great sunsets! Having visited this property over the last four years, I was taken back by the lack of maintenance this time. The sliding screen doors were broken and could not be fixed allowing a constant flow of flies to enter the house. I Had to spray for ants at entrance door and kitchen sink every morning. Lastly, the spa pump jets did not work and a few of the jets were broken. Amazing, Cozy, Beautiful, Spiritual, Lovely, Good Times, treasured memories with family. The Patio Is The Best! We spent two years at the location and have mixed emotions as to why we aren't returning for a third stay. We love the house and the beach - if we could pick up the house and the beach and take it to a better location we would do it in a heart beat! We don't like the town of Oceanside because of lack of quality restaurants and things to do and things to just see. We are going back to Newport Beach where these things are in abundance. But, maybe if we see we miss the house and beach we could possibly be back. Family Beach House Vacation. Everyone wanted to come back. 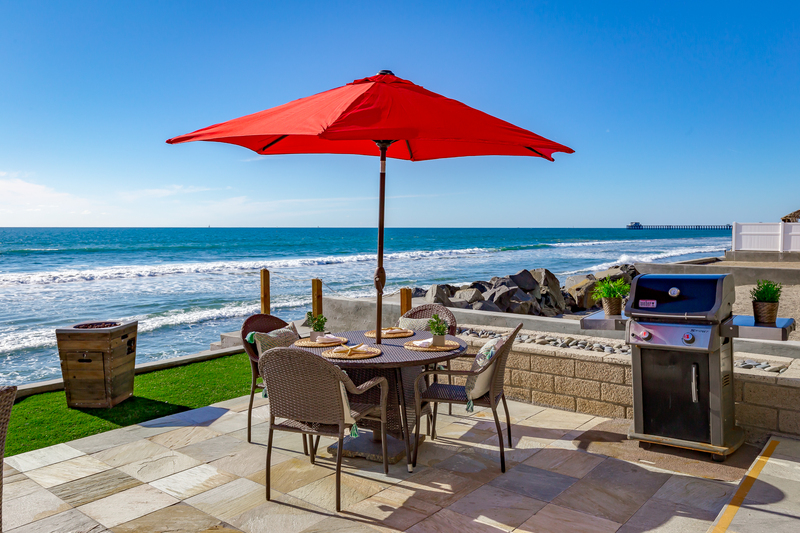 This is a great vacation home on a quiet section of the great beaches at Oceanside. The views are spectacular and being "ON" the beach is priceless! Everything you could possibly need in a vacation getaway. It was great being on the ocean level and being able to watch our children from the outside patio. The only complaint I had with the property at 1023 A was the noise of the guests that were on the upper property. They had small children that were running around and could be heard as though they were in our room. A word to those who stay in the upper dwelling is to know they can heard by the tenants downstairs. These particular guests weren't very respectful. Even with the noise of the guests upstairs we would stay in the lower unit again because it is on the beach level. Truly an awesome place to stay. Fabulous location, steps to water, views galore, great patio area. Can't wait to return! We had a phenomenal stay at this property. The photos didn't do it justice; it exceeded my expectations. The staff was very responsive and helpful. We'll be back again! Great House! The management was very helpful and maintenance was very responsive. The amenties are top of the line! We had an incredible time once again staying at 1023A S. Pacific. It is our favorite home away from home. We open the door and step onto the sand and life couldn't get better! May I recommend that you add to your info book the store "Cream of the Crop" for delicious groceries, sandwhiches & fresh foods, fruits & vegitables! The beach house is very well located. Couldn't be better - you are right on the beach. The place s very clean and well kept. The only big drawback is the check out time of 10:00am....which really is annoying. Rest all is great! I loved the property and the location!! Tried to rent it for 2011 but it was already rented!!!!! We loved it here! Wish we could move in permanently! A fabulous location and condo. The beach is excellent, the views amazing. One our second day a gray whale was feeding and breaching only a 100 yards from shore. We ran for miles on the beach at low tide. Overall, our 9 days were peaceful, relaxing and beautiful. I highly recommend this site. A recent storm had washed the steps to the beach away, so we had to climb up or down over the rocks, but his was not an issue for us. This property is in a great location. The beach was wonderful especially for the kids. The only issue we had was that the stairs shown in the pictures were broken and had caution taped wrapped all around them. I would have preferred them be removed or fixed as it messed up the gorgeous view. I would have liked to see a bigger TV. It was a bit small for the size of the room. It would have been nice to have beach chairs and toys available as I've seen advertised on other properties. But overall, it was a very nice place and the beach was great. We loved our beach front rental! It was everything that we could have asked for in terms of location (couldn't get closer to the oceanfront w/out getting wet), ammenities, cleanliness, and the staff at Beachfront only is outstanding. We only had one issue that concerned the excessive late night noise from the upstairs unit. However, it was addressed immediatly and we noticed the noise reduction right away. 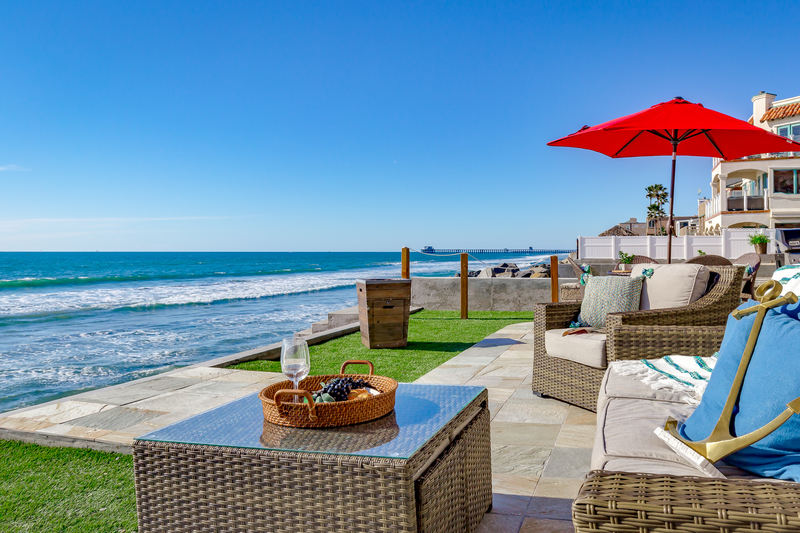 We will for sure be using Beachfront only for all of our future SD vacations! Thank you! This is our 2nd year staying at this location. We love it and always have a great time. The house is beautiful and the location is perfect. You can not ask for anything more perfect. Being right on the beach is the best!!!!! Thank you!!!!! we had a wonderful time there. I highly recommend this condo to anyone that wants privacy and quietness as well as cleaniness! telephones had a great deal of static, and my verizon wireless cell phone worked only on the street. The only concern we had was the hot tub was ridiculously hot when we arrived. It took hours before we could get in it and we like it HOT! But other than that, everything was spectacular especially the location! You definitely can hear your upstairs neighbors, but when you're on the beach who cares! We loved everything about our stay. Everything we needed was available, including the double washers and dryer. No dirty laundry to bring home. We would recccommed to anyone and plan on coming back next year. We were given the wrong acess code before arrival. I have to call the office at the door (we went to the upstair units by mistake using the code given to us. Luckily the guests there was not in at that time.) The office give me another code immediately which is very helpful. Check in was a bit stressful since we got there apprx 3:55 and code didn't work until 4:15 - it would be great if it worked about 3:45. House was great & set up was wonderful, perfect for a crowd at the beach! The hand mixer was broken but I called & a new one was sent over. We are already planning our return trip for next year! Problems included: 1) initial codes to house lock did not work, 2) no cell phone reception in house, 3) hot tub temp did not work correctly...either over or underheated..., 4) noisy when guests were upstairs, 5) would have liked better stocked kitchen. 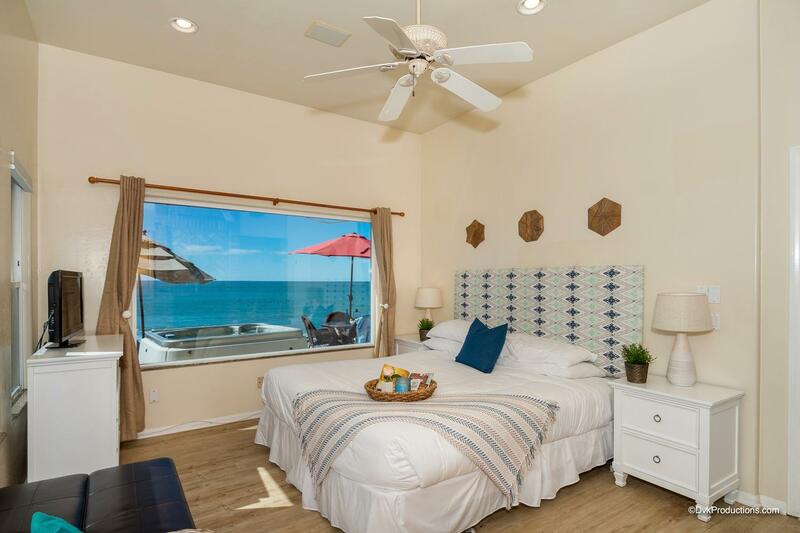 OPositives: Great location right on the beach, and very nice master bedroom. Loved it! We are planning to come back next summer and spend a week there. Overall we were very happy with this rental property for 2 families on vacation with young kids. One thing to note: Based on the pictures, we thought that we would be able to watch the kids on the beach while we sat on the patio, but the beach is actually down a staircase (somewhat steep) and too far for the young ones. Not a huge deal, but just a little bit more effort for everyone to hang out down on the beach. We had a great time and enjoyed our time.